Take a break from the ordinary any time you choose thanks to the Oasis Dining Table from Zuo Modern. This extraordinary table features a stainless steel base that dazzles as well as a rectangular tempered glass top that is both stylish and modern. Plus, the table's base includes a walnut finish that further boosts the piece's overall appearance. For a distinct dining table that looks great in any contemporary or retro dining room, there may be no better choice than the Oasis Dining Table. Rectangular tempered glass top blends style and elegance perfectly. Includes a modern picture frame-style stainless steel base that delivers outstanding support. Table base's walnut finish further enhances the piece's overall appearance. 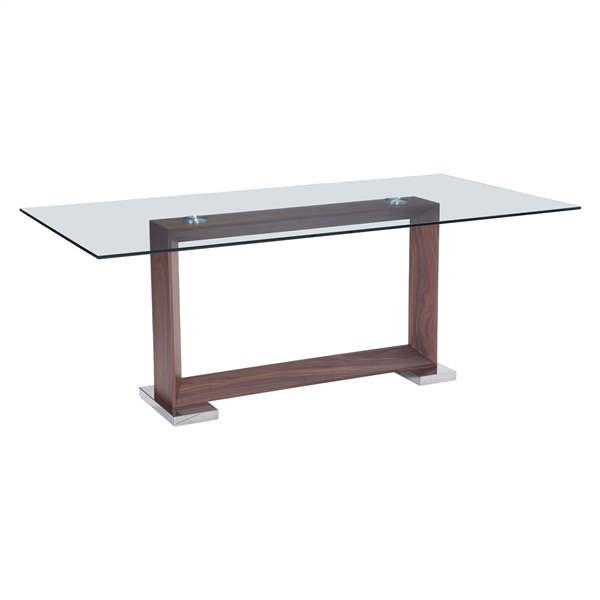 Sleek, modern design makes the table a great option in a contemporary dining room.